Matt loves cheesecake, so when I saw this one on Pinterest I thought Valentines Day would be the perfect day to try it out! It's delicious! My favorite part is the chocolate ganache at the bottom! The only thing I did differently was to use a graham cracker crust instead of the chocolate. You can view the recipe for the graham cracker crust I used here. Note on scheduling: This cake is easily separated into two days of preparation, and can be prepared ahead of time. 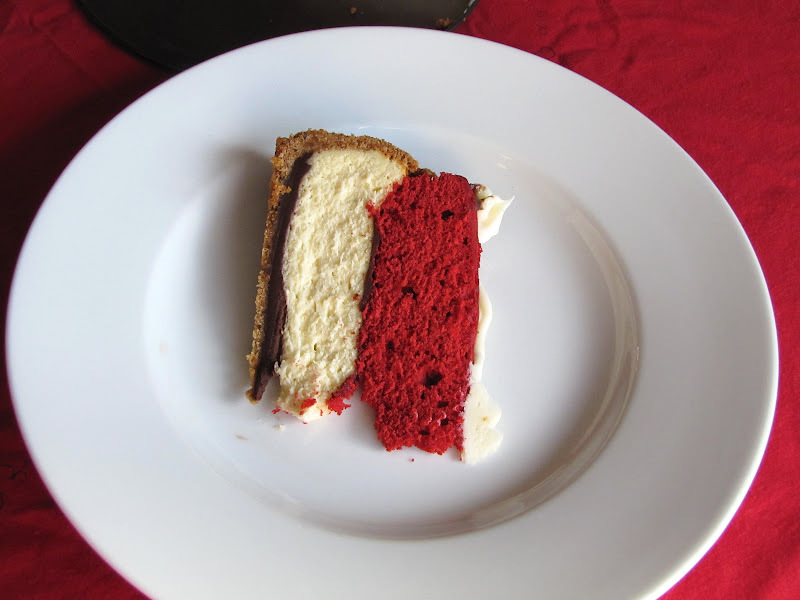 On day one, prepare the red velvet cake, cool it and freeze it. On day two, prepare the cheesecake. You can then assemble and decorate right away, or leave this for day three. Make the cake: Preheat oven to 350 degrees F. Line the bottom and the sides of a 9" round cake pan with parchment paper, leaving an overhang on two opposite sides to make it easier to lift the cake out of the pan when it's done. Cream shortening, sugar and eggs. Make a paste of the cocoa and coloring and add to the shortening mixture. Add salt and vanilla. Add buttermilk alternately with flour, beginning and ending with flour. Mix vinegar and soda right before using and add to mixture by folding in. Pour batter into the cake pan and bake at 350 degrees for 20-25 minutes, or until a toothpick inserted into the center of the cake comes out clean. Cool completely, cover in wax paper and freeze for 30 minutes or until firm. Make the cheesecake: To make the crust, preheat the oven to 350 degrees. Butter a 9" springform pan and place it on a baking sheet. Combine the chocolate cookie crumbs, melted butter and salt in a small bowl. Toss with a fork to moisten all the crumbs. Press into a thin layer covering the bottom and sides of the springform pan (at least 3 inches up the sides). Bring the cream to a simmer in a medium saucepan. Place the chocolate in a medium bowl. Once the cream reaches a simmer, pour the cream over the chocolate and let stand 1-2 minutes. Whisk in small circles until a smooth ganache has formed. Pour 1 cup of the ganache over the bottom of the crust. Freeze until the ganache layer is firm, about 30 minutes. Reserve the remaining ganache; cover and let stand at room temperature for later decorating. Preheat oven to 350 degrees and position a rack in the middle of the oven. In the bowl of an electric mixer fitted with the paddle attachment, beat the cream cheese and sugar on medium-high speed until well blended. Beat in the flour. Add in the vanilla and beat until well incorporated, scraping down the sides of the bowl as needed. Beat in the eggs one at a time, scraping down the bowl between each addition. Pour the filling over the cold ganache in the crust. Place the springform pan on a rimmed baking sheet. Bake until the top is lightly browned, puffed and cracked at the edges and the center moves only very slightly when the pan is lightly shaken, about 1 hour. Transfer to a wire cooling rack. Cool at room temperature for at least 30 minutes. Transfer to the refrigerator and let cool at least 3 hours, until completely chilled and set. Assemble Topping: Whip room temperature ganache to create a fluffy texture perfect for piping. In a separate bowl, mix together cream cheese, butter and confectionars' sugar to make a small amount of cream cheese frosting for decorating. Assemble the cheesecake: Wrap a warm towel around the outside of the springform pan to help loosen the crust from the sides. Carefully remove the springform. Transfer the cake to a serving platter. 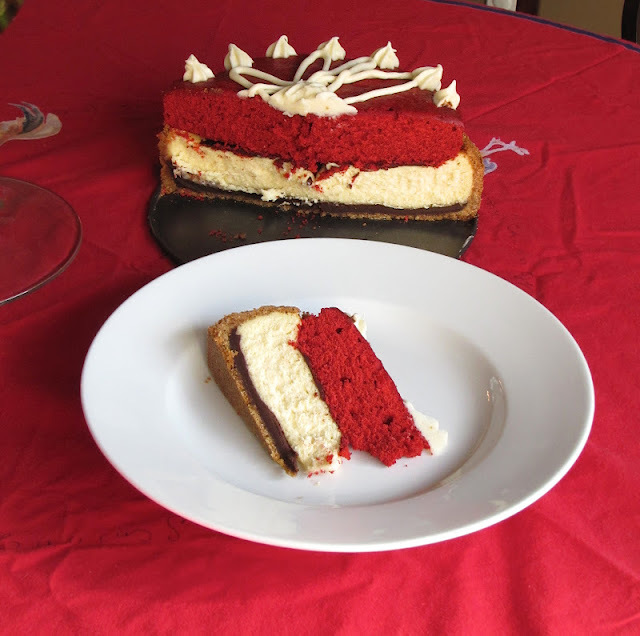 Here, you can schmear some ganache on the cheesecake to help the red velvet cake adhere. Decorate top of cake with drizzled white chocolate, piped cream cheese frosting, whipped ganache and strawberries. Linking up with a few of these wonderful parties.